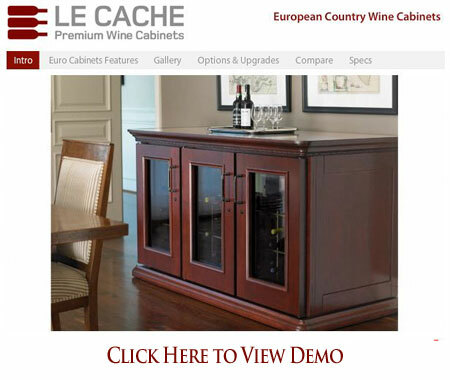 Le Cache Euro 3800 Wine Cabinet Chocolate Cherry (P/N 750). Designed by acclaimed, Pinnacle Award-winning designer Martin de Blois, our European Country Series wine cabinets evoke the timeless elegance of European furnishings. Architectural details such as crown and base molding, paneled sides, hardwood French doors and hand-carved accents showcase fine wine collections with a sense of luxury and style. Sealed seams, premium insulation and tinted double-paned glass provide thermal and UV protection.These options are included in the price of your wine cabinet. Great unit, even more beautiful in person, you will be happy. Seemed to get to temperature within just a few hours empty, although I did not start mine up until sitting flat for 24 hours since it was sideways while getting through my door. Be careful not to assume it will be white glove unloaded just anywhere. I originally wanted to put in the basement and was told it could be delivered there, Lucky for me I changed my mind before they arrived and found a better spot on first floor. However they mentioned had I not changed my mind they would not have brought it down the stairs. Also check dimensions not only where you will put it but front door and hallways to get it where you want before ordering. It comes boxed so you will want to allow a little more room too. It was tight but I was ok as it turned out. Mine was delivered with a chip on the front rack but because they came out right away to replace the rack I was very happy with the service, and it was not a big deal. Since I just got it I can't speculate on its longevity but seems very well built with a solid looking cooling unit. Since I have it in a living area I was concerned about the sound. So I got the sound dampener with top exhaust and although it wasn't extremely noisy without it, I would recommend getting a dampener unless you are putting in a noisy room. Lastly I would buy a clock outlet or replug it with a flat plug because the plug it comes with is pretty fat (deep) and I bought the top vent so I could cut it into the baseboard and be flat to the wall and this caused an issue for me. If your plug is to the side of the unit you will only need to worry about the cord thickness. The best compliment that I can give is that I would make the same decision again, buying from Le Cache was the right decision. The wine cabinet I ordered seems to be working just fine and is a very beautiful and unobtrusive addition to the room it is in. It has only been about a month. but so far I'm extremely satisfied with my purchase of your wine cabinet. Love the wine cabinet, best thing I have ever done, well almost.